A new coalition of groups in Wisconsin is working together to save the monarch butterfly. Over the last two decades, the population of monarchs in the eastern United States has dropped 80 percent, and researchers worry they’ll disappear altogether. "We're talking about formerly one of the most abundant, most certainly iconic and most recognizable insect species in the world," said Owen Boyle, species management section chief with the Wisconsin Department of Natural Resources. Those populations are down primarily because of habitat loss, according to Boyle. "It's all about habitat, and in particular it's about milkweed," he said. "The only plants that they can lay eggs on, and the only plants that their caterpillars can eat are plants in the group of milkweeds." More than 70 groups around the state are participating in an effort they are calling the Wisconsin Monarch Collaboration, including nonprofits, government, utility companies and more. "In some cases, some folks that aren't used to working together, from roadside managers to farmers, to protected natural areas managers to master gardeners and folks who live in the city ... this is one of the really, really exciting things about monarch conservation," Boyle said. 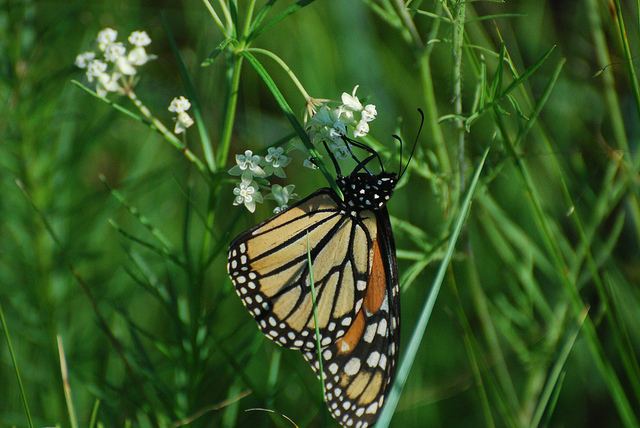 Monarchs also need a variety of flowering plants for nectar — any native prairie plant will do — but the biggest impact lies in planting milkweed or letting it grow wild, according to Boyle. And he emphasized that anyone can help. "Literally anybody can get involved no matter where you are, no matter what you do," Boyle said. "You could have an apartment on a high rise building and plant some flowers on your balcony and do things that are good for monarchs and for pollinators." Milkweeds are easy to grow – in many cases they may appear like weeds, he said. More often than not, it’s not a matter of planting milkweed, but rather not mowing where it grows wild in your yard, or along the road. But if you do want to plant milkweed, make sure it's native milkweed plants, not tropical varieties that are less nutritious and can cause other issues, Boyle said. Wisconsin is just one of 16 states working to restore monarch numbers. The U.S. Fish and Wildlife Service is leading the Mid-American Monarch Conservation Strategy, a 20-year plan tailored to each state's natural habitat. Efforts are measured by milkweed stems, not habitat space, Boyle said. "We've figured out that we need about 120 million additional stems of milkweed in the state of Wisconsin by 2038," he said. "That's our portion of the ... strategy which aims to add 1.3 billion stems of milkweed to essentially the upper Midwest." The ultimate goal, which has been agreed on between the U.S., Canada and Mexico, is an overwintering monarch population over six hectares – 10,000 square meters – in Mexico. "I've actually never seen anything like this in terms of size and scale to save a species," he said. "It's remarkable." While the plan is laid out over 20 years, Boyle hopes to see the monarch population begin climbing up in the next few years. The U.S. Fish and Wildlife Service is expected to decide next summer whether to add the monarch to the endangered species list.